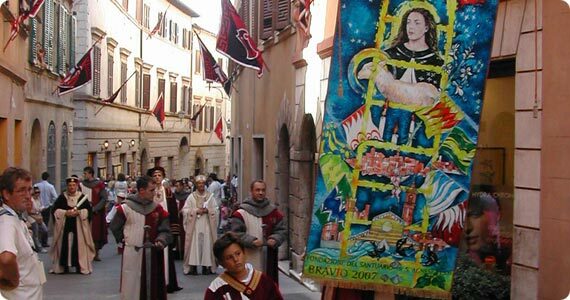 This is just a quick post to let our readers know that this Sunday, August 31 the town on Montepulciano in southern Tuscany will be the set of the annual competition between the town’s 8 contrade (or districts) known as the Bravìo delle Botti. The event is a contest between the various village districts to see who can roll their wine-barrel up hill and cross the finish line in front of the Duomo first. The “botti” are wine barrels that weigh 85 kilos and have a capacity of 500 liters of wine and the distance from the start to the Duomo is about 1650 meters. Montepulciano is famous for its “Vino Nobile di Montepulciano DOCG” and “Rosso di Montepulciano DOC“, both robust red Tuscan wines. The winner takes the “bravio” or price, which is a beautiful drape by a famous painter with an image of St. John the Baptist, Montepulciano’s patron saint. The “Panno” as it is called, is unique every year as it is designed and painted by a different artist. The day starts at 10am with a lottery to indicate the starting positions, which is then followed by a flag throwing presentation and the blessing of the “barrel pushers”. At 3pm there will be a historical pageant through the streets of the town, to be followed by a Medieval show in Piazza Grande at 4.30pm. The Bravìo delle Botti starts at 7pm, with the awarding of the Panno right afterwards. If you can’t make it this weekend, keep in mind that the annual event always takes place on the last Sunday in August.